Video from the Proof of Concept effort conducted at OBrien park in South Bend. The footage was recorded by Wes Evard of the College of Engineering and by the city drone pilot. 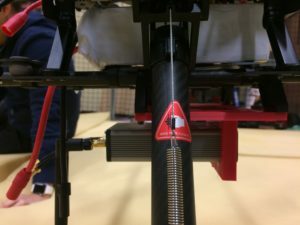 The Proof of Concept involved a DJII Octocopter drone carrying a SDR and phone payload as well as the Field Research Vehicle from Prof. Tom Pratt’s research group. Kudos to Prof. Hai Lin’s students for piloting and for Prof. Nick Laneman’s group for running the SDR gear. (March 20th, 2017) The Wireless Institute will be hosting a media briefing related to Notre Dame’s and South Bend’s ongoing development of a $25M Platform for Advanced Wireless Research (PAWR) proposal to the National Science Foundation. Mayor Pete Buttigieg and other City officials, Notre Dame researchers, and representatives from the St. Joe Valley Metronet will discuss site tests that were conducted over the past few weeks. The briefing will be held on Monday, March 20th from 2:45-3:30 pm at O’Brien Recreation Center in South Bend, 321 E Walter St., South Bend, IN 46614. Huge congrats to Nick Laneman (WI Co-Director) and Harish Punjabi (WI Managing Director) for getting this all together. (March 14, 2017) Our paper entitled “Leveraging Frame Aggregation for Estimating WiFi Available Bandwidth” was accepted into IEEE SECON 2017 (26% acceptance rate). The work is the second one under the Fast Mobile Network Characterization umbrella. This work focuses on the potential to use reflected aggregation (client-mod free) as observed by A-MPDU frame characteristics for inferring the available bandwidth of a link ranging across a wide variety of speeds. (March 7, 2017) Our paper entitled “Redundancy Elimination Might Be Overrated: A Quantitative Study on Wireless Traffic” was accepted to the INFOCOM workshop covering edge computing, caching, and offloading. This work drew from our NSF EAGER grant covering redundancy across a wide variety of environments (South Shore commuter train, University Relations tent, classroom). 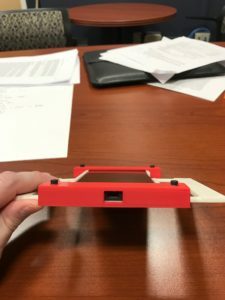 (March 7, 2017) The 3D printed mounts for the Ettus worked like a charm. 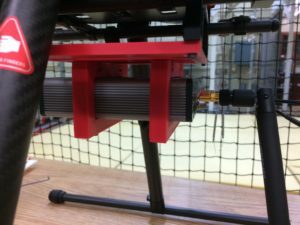 The construct consists of three parts, two holders that are held into the base of the Ettus USRP via M3 screws and then a mounting / gimbal base that connects to the drone via M2.5 screws. Material was a red ABS (Village Plastics, purchased from Lulzbot). (March 3, 2017) Our paper entitled “Leveraging Frame Aggregation to Improve Access Point Selection” has been accepted to appear at the INFOCOM International Workshop on Mobility Management in the Networks of the Future World (MobiWorld) workshop at INFOCOM 2017 to be held in Atlanta, GA in early May. (March 2nd, 2017) We just finished off and verified both of our mounts, one for the recent Google Pixel phone and one for the Ettus URSP 312. 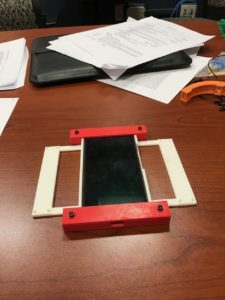 The following images show the prototype holder for the Google Pixel phone. The holder is set up with a fairly thin base to mount to the underbody of the drone. The phone itself is then held in with two holders on the edge (done in red) with a hole for USB access. All of the parts were done using ABS and printed on a Lulzbot TAZ 4 printer with the all-metal hot-end (0.5 nozzle, Cura 21.03).